Choosing the correct pen needle is primarily a matter of deciding what the appropriate cannula length is. 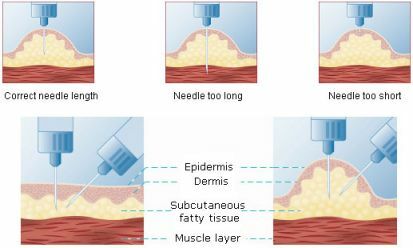 The thickness of the skin (or the body mass index), as well as the correct injection technique (angled or vertical injection) are important factors in this. The body mass index (BMI) is a measure of your weight with respect to your height. For injections into the upper thigh the cannula length should not exceed 8 mm, a skin fold should be made, and the injection should be made at an angle.